In order to fill this position the council needs a majority to approve an applicant. Not the voters, mind you. The voters get short shrift here and are told that in our representative democracy it’s good enough to be told who represents them. In reality, this whole process – from our gerrymandered districts to our inability to vote upon our own representation – is sad and rather pathetic. Our council has run up our pension debt while crying that Sacramento mismanaged the money we keep shoveling their direction year in and year out. When warned that a problem was coming we citizens were laughed at, ridiculed and ignored. Worse than ignoring us malcontents and gadflies, our council has ignored our infrastructure, sat idle while we were illegally taxed and over-charged on our water bills, resisted any form of police oversight or accountability, all but abandoned the Hunt Library, caused a lawsuit over Coyote Hills and on and on and on. We call ourselves “The Education Community” but we refuse to learn from our mistakes. We refuse to be honest, we refuse to be knowledgable and forward thinking unless it lines the right pockets or benefits the rights constituencies. And yet here we are waiting for our historically negligent and pompous council to tell us who is worthy to join them up on the dais. To make it worse here I am offering myself up as tribute. I’m not adding my name into the veritable Goblet of Fire because I think I can win over the council or because I think I’m a good choice – I’m doing it because I want to highlight how ridiculous of a process this is in the first place. When I ran for Council in 2016 I had to get 20 people to sign papers saying they supported the idea of me running to represent them. Today I don’t need even one. Not a single citizen has to support me to throw my name into the mix, not a single person has to walk for me or talk me up to their neighbors and worst of all not a single person has to vote for me. I can’t get 1, let alone 3 votes from council, but neither should anybody else. To paraphrase Denis from “The Holy Grail”, You can’t expect to wield supreme executive power just ’cause some watery tart threw a council majority at you! No, I don’t expect to be appointed or even interviewed. Yes, I’m aware that this is transparency theater. See you all at the NUFF event on Monday. In fact I hope they don’t hire any activists for this position. It should be an experienced, professional caretaker role until such time as we get to vote. It would be more appropriate for a gadfly activist to run in an election. These people can’t do math, they would drive a professional caretaker to suicide. Shut up, moron. The “experienced, professional caretaker” type like Jan Flory is responsible for the mess this city is in. Just saying, Anonymous, I don’t want any yahoos in the seat. Way to ensure your disappointment, because a yahoo it will be. I particularly like this: We call ourselves “The Education Community” but we refuse to learn from our mistakes. If you refuse to acknowledge mistakes as such, then how can you learn from them. The budget is balanced! I watch Fullerton and wait for it to become the City I know it can be. The city I grew up in, where cops gave speeding tickets to high school students, in fact they targeted them, but they lived to tell the tale. Where high school students drank in cheap skate every weekend and no one cared. Where the pensions weren’t a mess and only one eyed cops lived in fairy tales. This whole mess started with one guy that was pissed about a seat on the chamber he felt he was entitled too. 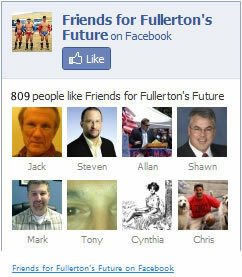 So know he gets to create a super majority of like minded people that will continue to drive Fullerton into the ground. I can only say thank you, because with everyday of this wretch super majority we get closer to seeing libertarians finally coming to power. Oh and for the one meaningless seat on the council, Bruce keep sitting there doing nothing and I hope you enjoy getting closer to that pension you are so politically against! Wrong universe. Libertarianism cannot exist outside of a cranial vacuum in this one.